As a manufacturer of hair care products for African American women, Madame C. J. Walker, born Sarah Breedlove, became one of the first American women millionaires. Madame C. J. Walker, named Sarah Breedlove at birth, was born December 23, 1867, in Delta, Louisiana, to Owen and Minerva Breedlove, both of whom were emancipated (freed) slaves and worked on a cotton plantation. At the age of six Sarah's parents died after the area was struck by yellow fever, a deadly disease oftentimes spread by mosquitoes. The young girl then moved to Vicksburg to live with her sister Louvinia and to work as a housemaid. She worked hard from the time she was very young, was extremely poor, and had little opportunity to get an education. In order to escape the terrible environment created by Louvinia's husband, Sarah married Moses McWilliams when she was only fourteen years old. At eighteen she gave birth to a daughter she named Lelia. Two years later her husband died. Sarah then decided to move to St. Louis, Missouri, where she worked as a laundress (a woman who washes people's clothes as a job) and in other domestic positions for eighteen years. She joined St. Paul's African Methodist Episcopal Church and put her daughter through the public schools and Knoxville College. Sarah, who was barely literate (able to read and write), was especially proud of her daughter's educational accomplishments. By the time Sarah was in her late thirties, she was dealing with hair loss because of a combination of stress and damaging hair care products. After experimenting with various methods, she developed a formula of her own that caused her hair to grow again quickly. She often said that after praying about her hair, she was given the formula in a dream. When friends and family members noticed how Sarah's hair grew back, they began to ask her to duplicate her product for them. She began to prepare her formula at home, selling it to friends and family and also selling it door to door. calling herself Madame C. J. Walker for the rest of her life, even after the marriage ended. Her husband helped her develop mail marketing techniques for her products, usually through the African American-owned newspapers. When their small business was successful, with earnings of about ten dollars a day, Walker thought she should continue to expand, but her husband thought otherwise. Rather than allow her husband's wishes to slow her work, the couple separated. Walker's business continued to expand. She not only marketed her hair care products but also tutored African American men and women in their use, recruiting a group called "Walker Agents." Her products were often used with a metal comb that was heated on the stove, then applied to straighten very curly hair. She also began to manufacture a facial skin cream. The hair process was controversial (open to dispute) because many felt that African American women should wear their hair in natural styles rather than attempt to change the texture from curly to straight. In spite of critics, Walker's hair care methods gained increasing popularity among African American women, who enjoyed products designed especially for them. This resulted in growing profits for Walker's business and an increasing number of agents who marketed the products for her door to door. Walker worked closely with her daughter Lelia and opened a school for "hair culturists" in Pittsburgh, Pennsylvania,—Lelia College—which operated from 1908 to 1910. In 1910 the Walkers moved to Indianapolis, Indiana, where they established a modern factory to produce their products. They also began to hire African American professionals who could direct various aspects of their operation. Among the workers were tutors who helped Walker get a basic education. Walker traveled throughout the nation demonstrating her products, recruiting salespersons, and encouraging African American entrepreneurs (business investors). Her rounds included conventions of African American organizations, churches, and civic groups. Not content with her domestic achievements, Walker traveled to the Caribbean and Latin America to promote her business and to recruit individuals to teach her hair care methods. Observers estimated that Walker's company had about three thousand agents for whom Walker held annual conventions where they were tutored in product use, hygienic (cleaning) care techniques, and marketing strategies. She also gave cash awards to those who were most successful in promoting sales. At Lelia's urging, Walker purchased property in New York City in 1913, with the belief that a base in that city would be important. In 1916 she moved to a luxurious town-house she had built in Harlem, and a year later to an estate called Villa Lewaro she had constructed at Irvington-on-Hudson, New York. Although Walker and her daughter lived well, they carefully managed each aspect of their business, whose headquarters remained in Indianapolis, and gave to a number of philanthropic (charity) organizations. According to rumor, Walker's first husband was lynched (killed by a group of people acting outside of the law). Perhaps it was partially for this reason that Walker supported antilynching legislation (laws) and gave generously to the National Association for the Advancement of Colored People (NAACP), eventually willing that organization her estate in Irvington-on-Hudson. The Walkers generously supported religious, educational, charitable, and civil rights organizations. Walker did not listen to her doctors' warnings that her fast-paced life was hurting her health. On May 25, 1919, when she was fifty-one years old, she died of hypertension (high blood pressure). Her funeral service was held in Mother Zion African Methodist Episcopal Zion Church in New York City. Celebrated African American educator Mary McLeod Bethune (1875–1955) delivered the eulogy (a tribute), and Walker was buried at Woodlawn Cemetery in the Bronx. Her daughter, Lelia, took over her role as president of the Madame C. J. Walker Manufacturing Company. Bundles, A'Lelia Perry. On Her Own Ground: The Life and Times of Madam C. J. Walker. New York: Scribner, 2001. Lasky, Kathryn. Vision of Beauty: The Story of Sarah Breedlove Walker. Cambridge, MA: Candlewick Press, 2000. Lommel, Cookie. 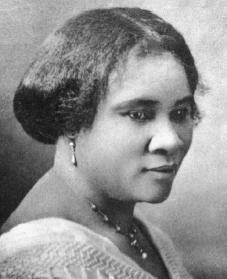 Madam C. J. Walker. Los Angeles: Melrose Square, 1993. McKissack, Pat. Madam C. J. Walker: Self-Made Millionaire. Hillside, NJ: Enslow, 1992. Taylor, Marian. Madam C. J. Walker. New York: Chelsea Juniors, 1994. Yannuzzi, Della A. Madam C. J. Walker: Self-Made Businesswoman. Berkeley Heights, NJ: Enslow, 2000. I really love this website, it gives great information! Especially for younger people like me. It's easy to understand, and great to take notes off of. Thanks for making all my projects about famous people great! Go Madame C.J. Walker! i love this page about Madma C J Wakler.because it is a topic on her. I thoroughly enjoyed reading this article. Madame Walker was such a pioneer for the professional liberation of women in America. I bet Mary Kay learned a thing or two from reading about her.It would be a wonderful idea for her legacy to be shared along side the male counterparts of her era.It would certainly be a welcomed inspiration and change from all the superficial images young women are bombarded with today. I admire her work of the hair product because she made an important diffrence today. I am a big fan of Madame C.J. Walker and I visit her grave site regularly. She is truly my hero an dhas inspire me to be a millionaire this year. I would love to get the opportunity to hav ea tour this month in her upstate mansion, since it is Black history month. I live in New Rochelle, NY. and I have drove passed her home many of times, but never visit. I would love to get a tour someday. This website is awesome!and it is easy to understand. Keep up the good work! Off this website I learned so much about Madame C.J. Walker. She is a Unique woman that made it through the bad to get to the good. I belive this site had great information but it didnt metion where she died. She died in Harlem, New York. She seems very determined to make the best out of what she has. And has proven that a woman can be just as great as any other man. i luv u. u made my hair look straight,healthy, and good all in one. I love the invention because my hair has grown a lot and looks very good when I comb it!! I love this article. It gives a lot of surprising information that I didn't know. Excellent biography. Madame Walker is such an inspiration not only to women but to society. Yes, but you should check out Sojourner Truth. I just, well you can get inspired by all of these brave women and I just think that the more YOU read, the better you'll under stand that we are all like these women.